Soccerex announces partnership with National Women's Soccer League (NWSL)! Home / International Football / Americas / Soccerex announces partnership with National Women’s Soccer League (NWSL)! Soccerex announces partnership with National Women’s Soccer League (NWSL)! Soccerex have announced a partnership with The National Women’s Soccer League (NWSL), who will be speaking at Soccerex USA. 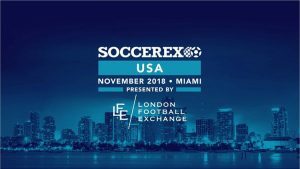 As part of the agreement, the NWSL will be participating in the upcoming Soccerex USA business conference on November 15/16 at Marlins Park in Miami as part of a panel of women’s soccer experts that will analyze the recent growth, assess the possible impact of the upcoming 2019 FIFA Women’s World Cup and evaluate what needs to be done for women’s soccer to realize its full potential in the U.S. and around the world. “We are delighted to have NWSL’s support for our event in Miami. Women’s soccer is such a massive part of the industry in the US and NWSL are at forefront of its continuing growth. Amanda’s vision and commercial acumen have been central to the League’s development and her insights are a valuable addition to the Soccerex USA programme,” said Soccerex Marketing Director David Wright. The panel will feature the NWSL’s Amanda Duffy as well as Portland Thorns President Mike Golub, Concacaf Head of Women’s Football Karina LeBlanc, and La Liga Women’s Football Director Pedro Malabia , and will be moderated by Equalizer founder Jeff Kassouf. Go to www.soccerex.com/usa for more information. Previous XtraTime VIDEO: Sony Norde looks forward to play again for Mohun Bagan! Next UEFA Referees train for VAR launch in Madrid!